Bow Wow Beauty Shoppe, San Diego, CA wins 1st Place "America's Coolest Store 2018!" Nearly 12 years of Pet Grooming Salon and Pet Boutique merchandising and services have not gone unnoticed. 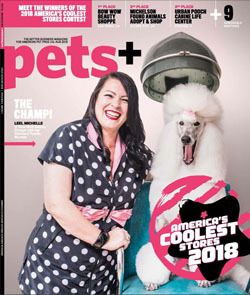 Years of obsessing, creating, changing, moving, succeeding, and failing have finally come to fruition with this front cover honor for me and my Standard Poodle Mumsie! For years I have enjoyed coming up with new design and sales techniques. I'm proud to be able to use this blog as a forum to add my pearls of wisdom to inspire others and hope this award will prove how much years of hard work can pay off! I have some very touch competition and am still so honored to have even been considered. Link below for the full story inside the Pets Plus Magazine! ! Všetky nožnice sú k dispozícii v japonskej nehrdzavejúcej oceli.